A complaint of bullying has been formally laid against Wally Haumaha. This increases the pressure on him (and the Government). with an inquiry under way over his controversial appointment. A formal complaint of alleged bullying has been laid against deputy commissioner Wally Haumaha. The complaint was laid by one of the three women who walked out of Police National Headquarters in June 2016 and refused to return because of Haumaha’s alleged behaviour. The Herald revealed last month that the three women told their managers, did not return to PNHQ, and continued working on the project from the Justice Ministry offices. One of the women confirmed to the Herald she formally laid the complaint last week, although the police last night refused to comment, or even acknowledge the complaint had been laid. This was on the grounds that Mary Scholtens, QC, who is heading the Government inquiry into the appointment process of the deputy commissioner job, has said she will consider the bullying allegations. In response to questions from the Herald, Deputy Commissioner Andy Coster declined to answer, citing a letter from Scholtens requesting information from the police including whether any complaint was laid formally, or informally, but only prior to Haumaha’s appointment in June. However, the minute released by Scholtens which confirmed she was considering the bullying allegations specifically noted “this does not prevent any complaint being made to, or considered by, any other agency”. 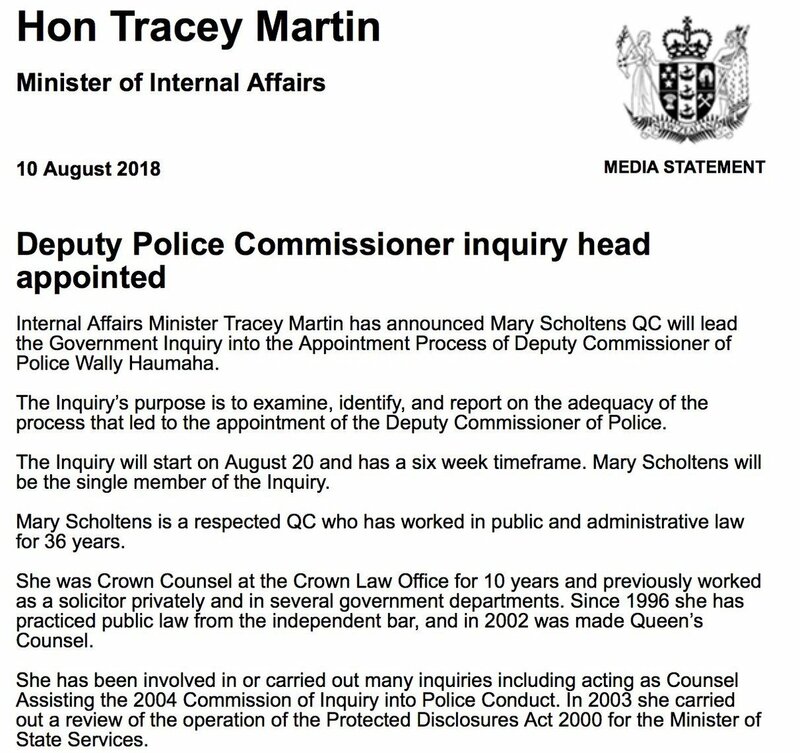 For some reason this isn’t on the Beehive media release website, but the Minister of Internal Affairs announced a new appointment of Mary Scholtens to head inquiry into the appointment of Wally Haumaha. Good to see Govt has taken our advice and appointed a highly respected independent QC for the Haumaha inquiry. Should have been case from start. Still inappropriate NZF Min Martin is the appointing Minister, terms of ref still inadequate too. And big qu’s still for Ardern/Nash. This was announced late on Friday afternoon. A series of scoops by Herald investigative journalist Jared Savage, some astute political work by National rising star Chris Bishop and some own-goals in the Government have ensured that the issue has been kept alive. It is a much more challenging problem for Ardern than just identifying someone suitable to find out whether the appointment panel and ministers had all relevant information – that much is known already. It is mired in complexity and even a resignation by Haumaha, which does not appear to be imminent, would not cauterise it. Underlying it is the public’s confidence in the police and the public’s confidence in the Government to deal with challenging issues. It involves Ardern’s confidence in Police Minister Stuart Nash, and Nash’s confidence in the judgement of Police Commissioner Mike Bush, who sat on the panel. There were signs of trouble at the outset when Winston Peters was dealing with it as Acting Prime Minister. The delay was in finding a suitable reviewer who would have the confidence of the Police, Maori and feminists. That in itself is a reflection of the identity politics that is more important in this Government configuration. National would have quickly found a retired judge or QC, which is what Ardern did last night in getting respected QC Mary Scholtens to undertake the inquiry. Scholtens was Counsel assisting the 2004 Commission of Inquiry into Police Conduct, and has conducted an inquiry for the last Labour Government into how the whistle-blowing laws have operated. Scholtens is not considered a political risk at all – she is the wife of former National minister John Luxton and has worked for Governments of both hues. Scholtens was on the list of ten names put forward to head the inquiry. It would have saved a lot of grief if she had been selected in the first place.